See this cute little Chihuahua? We met her at The Humane Education Society’s Paws in the Park. Her name is Posha, my friend and I are in love with her. Her owner warned us that she is very protective and will bite you, expecially when noshing on a yummy treat. My friend still pet her, and yes Posha bit her. I think there might be something wrong with us when we will forgo all common sense just to pet a cute dog. Each year, Keller Williams Realty organizes a benefit for The Humane Education Society-Paws for the Cause. This year, it was held at The Mill and was a great event. My husband’s company, Papa Services, sponsored a table and we invited some of our animal friends to join us. The event raises money through corporate sponsors, table sponsors, and a great silent auction. There was food, drinks, and entertainment. We really enjoy the event and helping out HES who does so much for the animals of Hamilton County. This is Alan, the pug, and he is our house guest for the weekend. Within just hours of being at our house, we began calling him Big Al. He is a lot taller than our pugs, so the name just seemed to fit! Big Al’s story: Alan was found as a stray and taken in by the Humane Education Society of Chattanooga (HES). I was contacted by some of the volunteers who go to the shelter to help bathe dogs on the weekends-could pug rescue help this little black pug out? 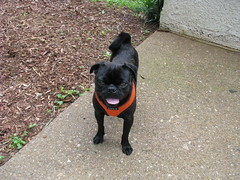 Yes, Southeast Pug Rescue & Adoption (SEPRA) had an open foster home in Illinois that could take Alan into their home. So after a lot of emails and phone calls among HES, SEPRA, and me; I picked Alan up on Saturday. This type of partnership between shelters and purebred rescues is a win-win for everyone. It gets the dog, pug in this instance, into a foster home so their personalities can be assessed and they can be waiting for a new home. It also makes room for another homeless dog at the local shelter. Just another fine example of organizations working together for the common good of the animals! After picking Alan up from HES, we took a brief trip to Standifer Gap Pet Hospital to see Dr. Katie. Alan had recently been neutered while at HES, but seemed to either have some flea allergies or some skin issues. In just a matter of days, he had chewed on his back side and created some bald spots in his fur. Poor Alan. We got him some medications and a prescription for some hugs & kisses! We also found out that Big Al is only 9-12 months old-so that’s where all of that energy was coming from! I must say that for him being so young, unknown background, just being neutered, and in a new place he was a great house guest. He immediately found the big bucket of pug toys, picked out a bed to call his own, and got a new harness & leash! On Monday, Alan will make his way to Illinois where his foster home is anxiously waiting for his arrival! To find out more about Alan and other pugs for adoption you can visit SEPRA or find a rescue in your area. We went to Paws in the Park on Sunday. 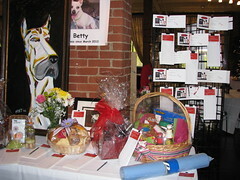 It was a fundraiser for the Humane Educational Society (HES) which serves Hamilton County. This was our 3rd year to attend, but this is the first year it was held at the Baylor School campus. It was a wonderful event to raise money and awareness for the homeless dogs and cats in our area. 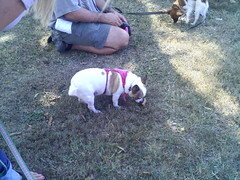 They had a parade of adoptable pets and there was even a pug mix that strut his stuff for the audience. There was such a variety of people and pets that all came out for the common goal of helping the animals! After announcements, there was a fun walk. Teddy and Lola got to ride in the stroller. Baby Girl was leading the Papa’s Pugs Pack and Louise was bringing up the rear! It was a wonderful weather to be out at such a scenic location and for such a great cause. The best part of the day was that the pugs were completely exhausted and slept like rocks through the night! You are currently browsing the archives for the HES category.